Wire Rope and Aircraft Cables – Tyler Madison, Inc. These cables are employed throughout an aircraft, used for everything from adjustable seat back control to the controlled movement of the wing flaps and landing gear in planes with analog flight control systems. Aircraft cables are stranded wires that are used in a wide variety of applications on or around aircraft. They are used as harnesses for electrical wiring as well as tie-downs, stabilizers, safety fasteners, and for many other purposes. Outside of the actual aircraft the same cables may be used in the form of wire rope slings to lift jet engines, wings, and other components into place during assembly or repair. These specialized high strength cables are also used as arresting gear which stops aircraft when landing area is limited by engaging the tail-hook and transferring the kinetic energy. While aircraft related uses abound and the name seems limiting, aircraft cables are actually very versatile and used in numerous applications where their high strength, corrosion resistance, and smaller diameters are needed. Industries such as agriculture, marine, irrigation, and more commonly use this type of cable as do military and aerospace applications. 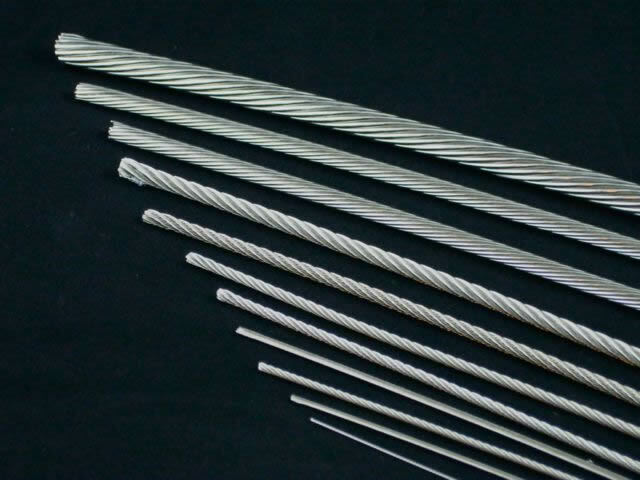 Though these cables are a type of wire rope, the main distinction is that wire ropes are commonly available with diameters no smaller than 1/4inch while aircraft cables with diameters as small as 3/64 inch are commonly used. There are two main types of aircraft cable available based on material composition. The highest quality cable is made of stainless steel, either 316 or 302/304 depending on the application. Stainless steel cables offer high strength, fatigue, and corrosion resistance even in salt water, caustic or other harsh environments.The second type, galvanized cables are steel cables hot dipped in zinc for increased durability and corrosion resistance. In a mild environment, the latter is an economical alternative as the two have similar pulling strengths, but stainless lasts longer under harsh conditions. Aircraft cables of either material consist of individual wires twisted and braided into strands which are then laid around cords. Like most wire ropes, aircraft cables are identified by not only the material but the number of strands in a rope followed by the number of wires in each strand. Common configurations include 7 x 19, 7 x 7, 3 x 7, 1 x 19 and 1×7. Identification codes can also be extended to specifics which are abbreviated to quickly denote core type, workload limit, and more. Cables are made to suit different applications and as such are produced in a number of different configurations with variable lays, diameters, and materials. As aircraft cable is a specialized form of wire rope, it is important to understand the capabilities of the cable prior to purchase. Aircraft Cables Aircraft cables are specialized strands, cords, and wire ropes designed for use on and around aircraft of various types.